The Principate form of government, which was de facto a constitutional monarchy where many of the various powers of the different magistrates (tribunes, consuls & proconsuls as well as sacral duties) were once again aggregated in one person, the Princeps (the first among equals). The Principate period actually lasted until 285 AD, when Diocletian reformed the government and replaced the Principate with a new more explicitly monarchical form of government, the Dominate. However, the Principate had stopped functioning as a stable governmental form by 235 AD. The subsequent 50 years were a time of chaos, political fragmentation and internecine warfare. The Regal period is divided by reign, which is also true of the Imperial period (Principate). The Republican period is more complicated because the executive power—held by 2 consuls—changed each year. Organizing chronology by consuls would be too detailed and unwieldy. So the Republican period is divided into early, middle and late. It is further subdivided by the year/years in which important political (e.g., plebeians granted the right to hold elective office) or military (e.g., the sack of Rome by the Gauls) events took place. Within each year or series of years, you will find summaries of the important events, plus whatever material or literary evidence is available; pictures of buildings, coins, and biographies of important personages. If the information is based on oral history or legends, those will be excerpted and referenced. Each section will be supported by primary and/or secondary sources. Where helpful, there will be multimedia presentations. As Livy makes clear, all of the written records existing prior to 390 BC were destroyed when the Gauls sacked Rome. Thus much of what we know about the Regal period and the early Republic was recorded roughly 300-to-750 years after the fact. Much of it may be fiction. For example, the seven kings of Rome all had impossibly long reigns, covering a total of 244 years. Either there was a greater number of kings or the Regal Period was significantly shorter than stated by Livy. Furthermore, some of the numbers that Livy uses to estimate the population of the nascent Roman state under the kings seem unrealistically high. The archaeological record for the Regal and the early Republican Periods is often thin and doesn’t seem to support the existence of such a large population. It isn’t until the beginning of the 3rd century BC that we begin to see reliable records. And it isn’t until this period that we have actual physical evidence (epigraphic) for the existence of Republican offices; for example, that of consul. 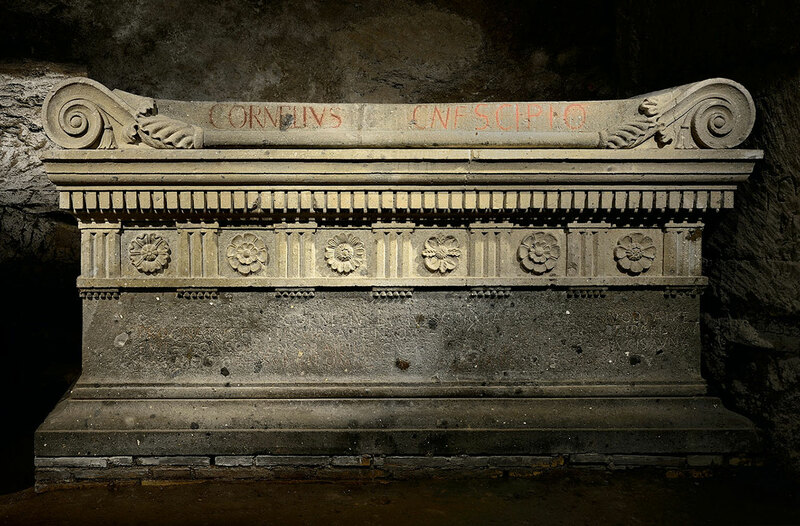 The office is first mentioned on the sarcophagus of a certain Scipio (Cornelius Lucius Scipio Barbatus). The Pro Romanis timeline is divided into three general periods; the Regal (Monarchy), the Republic and the Principate. The Regal period is represented by a bronze coin with an image of Romulus, the legendary founder of Rome. This coin is part of a series created by Jean Dassier, a Swiss 18th century metal engraver. The Republican period is represented by a bronze bust of Lucius Junius Brutus circa 300 BC. The likeness generally aligns with other representations of Brutus. It is a fine example of Roman portraiture from the Republican period. The artist may have been Etruscan. The head was combined with a contemporary bronze cast of a bust and the whole piece was presented to the city of Rome by Cardinal Rodolfo Pio da Carpi in the 16th century. The Principate is represented by a marble statue of Augustus as a pontifex (priest) maximus. The statue is located at the Museum of Roman Civilization, Rome. Many of these statues were produced during the reign of Augustus for propaganda purposes. 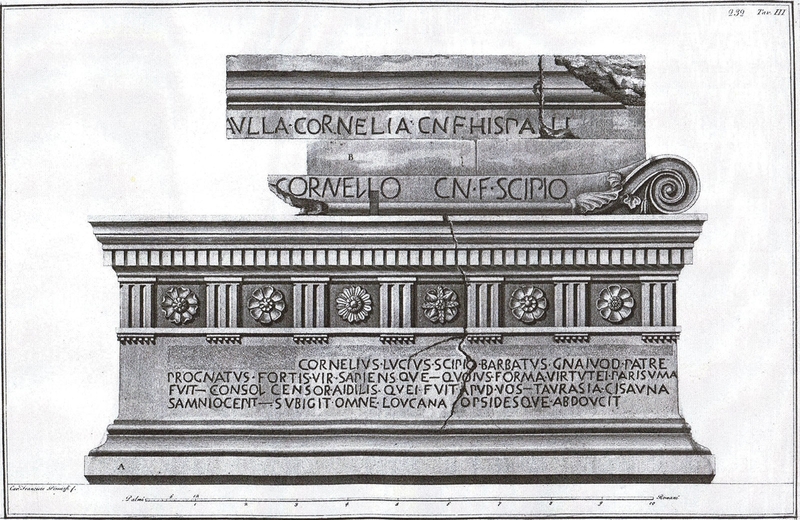 The sarcophagus of Cornelius Lucius Scipio Barbatus, dated to approximately 280 BC, is the first epigraphic example of the use of the Republican office of consul. It was found in a mausoleum of the Scipiones. During the republic the tomb was located in the angle between the Via Appia and the Via Latina on a connecting road joining the two just past the branch point. It was originally outside the city not far from where the Via Appia passed through the Servian Wall at the Porta Capena. Today, the sarcophagus can be seen in the Vatican Museum. Engraving of the Scipio Barbatus sarcophagus by Piranesi. How far into the past we can project this office (dated to 298 BC) is unclear. In short, we’re looking at data that are incomplete and very old and we should be careful in how much faith we put into the claims made by writers such as Livy. Mary Beard SPQR: A History of Ancient Rome Liverlight Publishing Company, NY, NY, WW Norton & Company Ltd. Castle House, London. 2015.